The Grayhawk HOA Social Committee is responsible for the planning and execution of events that harbor a sense of community within the neighborhood. 2018 GRAYHAWK ANNUAL FALL GARAGE SALE! Come be a part of the parade! Parade line-up begins at 8:45 am at the corner of Bayfield Dr. and Rhinelander Dr. The parade will travel east on W. Talon, through the Grayhawk Blvd Circle, onto E. Talon and end at Boals Elementary. 2018 Annual Spring Garage Sale! at the corner of Bayfield Dr. and Rhinelander Dr.
Family 4 pack to Hawaiian Falls! Gift certificate to sweetFrog Frozen Yogurt! Golf Carts, Truck beds or even trailers! Classic Cars! Hot Rods! Tricked out rides! onto E. Talon and end at Boals Elementary. FREE Light Sabers to the first 50 children! Don't forget to bring chairs, blankets, and drinks! Come have a great evening under the stars! 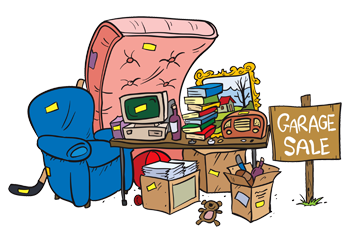 2017 ANNUAL SPRING COMMUNITY GARAGE/YARD SALE! From The 2018 July 4th Parade! * Access limited to registered users only. If you are a resident or homeowner and want to see this content, we encourage you to Register. Registration is quick and easy and is a benefit for all homeowners of this association.